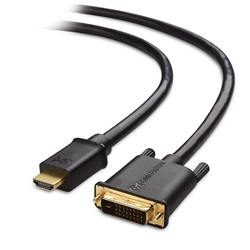 * This High Speed Certified HDMI to DVI Cable is fully HDMI 1.3b compliant. It delivers high-resolution digital video from an HDMI-equipped device to a DVI-equipped device, or vice versa. * This is a high performance home theater interconnect for Blu-Ray DVD players, satellite boxes, LCD, projectors, plasma HDTVs, a/v receivers, and other HDMI-equipped devices. * CL3 rated HDMI to DVI bidirectional cable is suitable for your in-wall installation projects. * Supports Deep Color: 10-bit, 12-bit, and 16-bit (RGB or YCbCr) color depths.